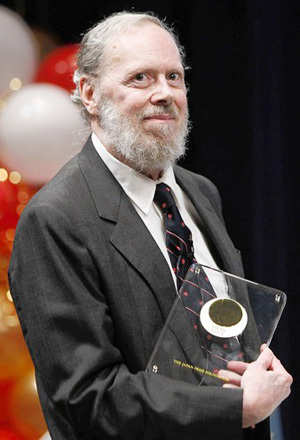 Dennis Ritchie, a computer scientist who wrote the popular C programming language and helped develop the Unix operating system, has died. He was 70. Ritchie died a month after his birthday, according to his biography on a Web page of Alcatel-Lucent's Bell Labs. Ritchie joined Bell Labs in the late 1960s. The company announced his death Thursday but did not give the cause or say when Ritchie died. Ritchie is best known for his contributions to computer programming and software. The C programming language, which he developed in the early 1970s, is still popular. It has gone through a number of upgrades, and it is commonly used for website development and other computer tasks. The Unix operating software also surged in popularity. It and its offshoots, including the open-source Linux, are widely used today, in corporate servers and even cellphones. Ritchie was born Sept. 9, 1941, in Bronxville, N.Y. His father, Alistair, was a systems engineer at Bell Labs and his mother, Jean, was a homemaker. After studying physics and math at Harvard University, Ritchie joined Bell Labs. "My undergraduate experience convinced me that I was not smart enough to be a physicist, and that computers were quite neat," Ritchie wrote. "My graduate school experience convinced me that I was not smart enough to be an expert in the theory of algorithms and also that I liked procedural languages better than functional ones." At Bell, Ritchie and colleague Kenneth Thompson worked closely to create Unix. In writing the C language, Ritchie built on Thompson's earlier B language. Their collaborations were intended to simplify operating systems and make the software portable and easy to move from existing hardware to new computers, resulting in the open-source movement of sharing ideas. "I wanted to find out what things a program or operating system could make possible that you couldn't do before," Ritchie told Investors Business Daily in 2003. Bell Labs' emphasis on research provided opportunities for Ritchie and Thompson to develop pioneering innovations. "There are features in C that everyone takes for granted now," Doug McIlroy, a Bell colleague, told Investors Business Daily. "But when Dennis created them, they were new to the world."